This sensor includes a molded handle for easy hand-held use. The coiled extension cable extends to 5 feet (1.5 meters) in length with a 100 ohm Class B DIN platinum element. This product comes standard with probe diameters of 1/4", 3/16", 1/8", 6mm and 3mm, with standard probe lengths of 12", 18", 24", 300mm, 450mm and 600mm. Standard: Specify 1/8", 3/16" or 1/4" for probe diameter in inches. Metric: Specify: M30 or M60 for probe diameter in millimeters. Note: PFA Coating is available, with a handle that is not molded in place. Order standard part number with a suffix “-PFA”. 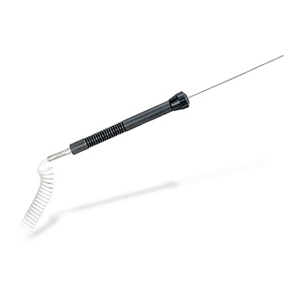 Price: add $20 to 300 mm (12") probes, $25 to 450 mm (18") probes and $30 to 600 mm (24") probes. 200°C (400°F) max.